India has firmly backed climate change chief Rajendra Pachauri - who has been under attack over recent scientific errors - at UN-led talks in Delhi. PM Manmohan Singh said India had "full confidence" in the Intergovernmental Panel on Climate Change (IPCC) and its chairman, Dr Pachauri. Environment minister Jairam Ramesh, previously critical of the IPCC, said the government backed him to the hilt. The Delhi talks are the first major climate change forum since Copenhagen. The convention comes amid a row over climate change science which has seen sceptics seize on scientific errors to support their case. 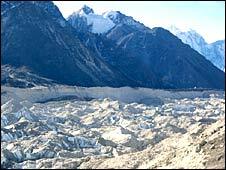 The IPCC - the UN's climate science body - admitted last month that it had made a mistake in asserting that Himalayan glaciers could disappear by 2035, a date it included in its 2007 assessment of climate impacts. The issue, which BBC News first reported on 5 December, has reverberated around climate websites since. Mr Singh sought to play down the row as he gave his support to Dr Pachauri. "Some aspects of the science that is reflected in the work of IPCC have faced criticism, but this debate does not challenge the core projections of the IPCC about the impact of [greenhouse gases] on temperature, sea-level rise and rainfall," he said. "India has full confidence in the IPCC process and its leadership and will support it in every way that we can." He said the latest talks were an important step in moving forward from the Copenhagen climate summit in December, at which no new global agreement was reached. Speaking in Delhi on Thursday, UN Framework Convention on Climate Change executive secretary Yvo de Boer also said errors in the IPCC report on Himalayan glaciers should not detract from the overall conclusions drawn in the study. He acknowledged some mistakes had been made, but said the science behind global warming "remains robust" and that the report itself was underpinning political decision-making in a serious way. 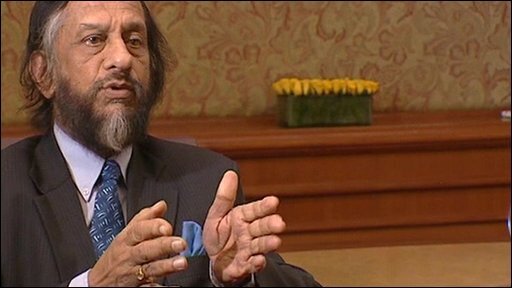 Dr Pachauri defended the IPCC's record in an interview with the BBC. "There is one mistake that occurred unfortunately, and we have clearly accepted that; we have expressed regret that it took place," he said. "But there's a huge volume of science over there - I mean, the IPCC's fourth assessment report is a massive piece of work - and I think all of what we have said over there is totally valid." Dr Pachauri also dismissed UK press allegations that he has made a fortune from carbon trading thanks to links between The Energy Research Institute (Teri), which he heads, and private companies. Any money he earned from advising companies went to Teri, he said, adding: "Not a single penny goes into my pocket." Mr Ramesh's current support for Dr Pachauri follows stern words from the environment minister last month. The endorsement that Manmohan Singh has given to Rajendra Pachauri appears highly significant in two ways. For him personally, it is strong backing from a government that in recent months has been a harsh critic. For senior UN officials, support from their "home" government can be vital to keeping their jobs when criticism is in the air, as it is now. More importantly, Mr Singh's choice of words makes clear that despite the IPCC's recently documented lapse over the likely melting date for Himalayan glaciers, his government finds no reason to dispute the panel's core projections about the progress of climate change or its impacts. That appears to be the case among virtually all governments, with only some Chinese and Saudi officials expressing doubts. Mr Ramesh said there was no "conclusive scientific evidence" linking global warming to the melting of glaciers and that the IPCC had "a lot of answering to do" on how it had reached its 2035 date. Academics had previously questioned the IPCC's 2035 figure, saying it was "wildly inaccurate". The BBC's Chris Morris in Delhi says that after the failure of the Copenhagen summit to reach a comprehensive agreement on tackling climate change, this has been a bad start to the new year for the UN negotiating process. The UN, along with a number of other nations - such as the EU, is hoping that a legally binding can finally be reached at the next major climate summit in Mexico City later this year. But for the moment, controversy over climate science has taken centre stage, adding fuel to the arguments of sceptics who believe global warming theories are alarmist, our correspondent says. Late last year, the Climatic Research Unit (CRU) at the UK's University of East Anglia was also engulfed in a row over leaked e-mails between leading climate scientists that led to accusations that evidence against man-made global warming was being suppressed.